Starbucks Tazo Tea Gift Set. 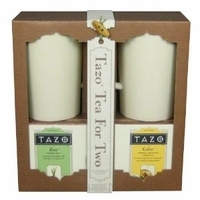 Tazo Tea gift set makes the perfect Christmas Present for the tea lover. You get two 11.5 oz mugs, 3 tea bags of Tazo Awake Black Tea and 3 tea bags of Tazo Zen green tea. Tazo Awake Tea is a bold breakfast tea . Although this is a breakfast tea it is invigorating any time. Tazo Zen Tea is an blend of green teas and rare herbs.